Hello Friends. Hope this post finds you well. For those of you living in the US, happy 4th of July Holiday weekend (and see end of post for a holiday special we’re running)! Added a setting for disabling the lighting effect that is used when buffering playback. This was causing a crash on some Windows Phone devices. 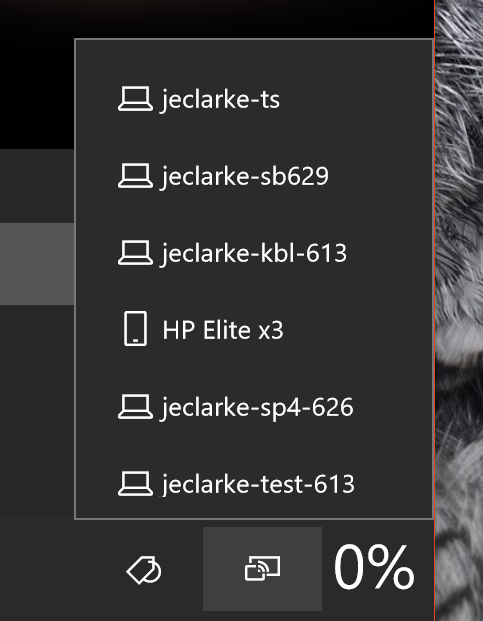 And from there you can click on another device, like your Elite x3 and playback will continue there picking up at the same spot. Why James”, you say, “That’s great and all but I’d really love to have the same experience with my” (insert your favorite mobile device here). We hear you. Definitely looking into this scenario as well. That’s all for now.. apart from.. because it is a celebrated holiday in the US, we are dropping the price of a BringCast 4 pro annual subscription from $6.99 to $1.99. That’s over a 70% discount! Get it while it’s hot.. offer ends on Friday 7/7/2017. Subscriptions are what get’s you access to the full feature set of BringCast including experimental features and also is what helps to keep the lights on our end so we thank you for helping to keep things going here. V4 is Out! 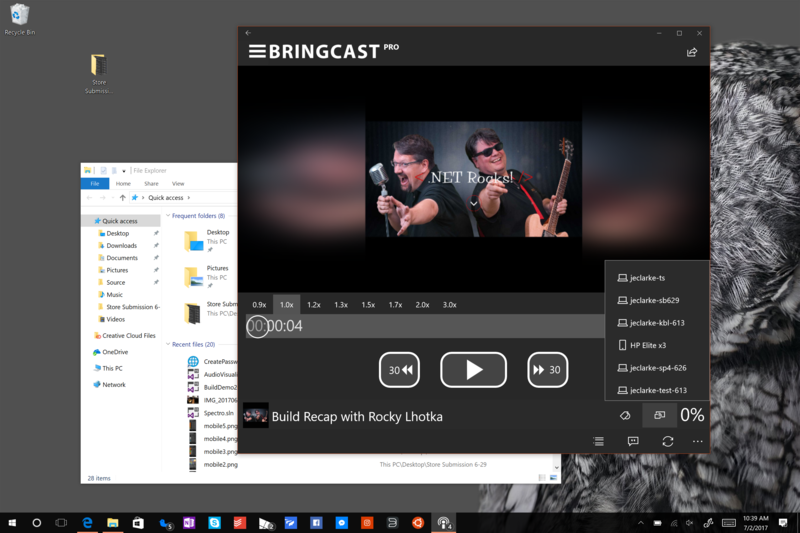 Back in January we released the official version 4 release of BringCast after a marathon development process. This was certainly a huge milestone for us as the porting journey ended with the codebase running as a Universal Windows Application on desktop and mobile Windows devices. Thanks to all our loyal users and supporters who have stuck with us over the years. New Licensing Model: One of the changes we’ve made in V4 of the app is our approach to licensing. There were really two main goals for this change: 1) have a fully free version of the app with no adverts and a decent entry level feature set 2) move our paid offering to a subscription model. It is simply not economical to ship an app for a one-off payment of a dollar or two these days. Hence we’re hoping that users that value the more advanced features are willing to invest in us and in future versions. And for those that aren’t, we hope that the free offering will be good enough. This is certainly something of an experiment and we’ll see how it goes. Users who are willing to support us and invest in a Pro subscription will get all the latest features automatically before they become part of the main product. We’re also hoping that the level of income that Pro generates is sufficient to support a cloud sync service. Time will tell. Thanks: Again, thanks to all who have stuck with us and continue to use the product. You inspire us to keep going! If you really want to help out, please do rate us in the store: it really does help us out. thx y’all, you totally ROCK! We got to the bottom of the pending issue.. you will need to temporarily disable backup of BringCast under settings->Backup->More options. We have developed a fix for this but it will only be deployed when we cut over to the production release app at RTM. Use the above workaround in the meantime. Other than that, this build is pretty much fixes only. We’re actively trying to track this down. Thx for your help. This is likely the last public build before we switch over to the RTM branch and push to the official app. Thanks to all for the help with testing. Cowabunga! The good news is that the Anniversary Update has a ton of new end user and developer features and we now get to take advantage of the latter in BringCast. To that end we’ve spent the last couple of months working on an update to the BringCast 4 public beta that specifically targets the Anniversary update. A big focus for this update is stability and polish.. we’re now focused on shipping and the good news there is that this build is now feature complete. Looking back through our source control system, we’ve made 1175 checkins since July fixing bugs and adding features. Improved Playback Stability: This is the biggest item that has simplified the code and drastically improved stability of Playback. For the developers amongst you we’re now using the Single Process background model which you can read more about here . Improved Import Export workflow: increasingly we find ourselves listening to and watching podcasts across a number of different devices. Since we don’t currently have a cloud backend (more on that in a future post) we wanted to offer an improved workflow with OneDrive. Using the new import / export workflow accessible in settings it’s now possible to save and restore all your subscriptions, playlists, the state of what’s listened to and not as well as what’s downloaded. It’s ease to restore back to the exact state that your in on a new device. Items you downloaded before will be automatically downloaded again. Improved Onedrive Login: Coupled with the above, we’ve made it easier to log in to OneDrive by moving to using integrated authentication which means you can simply pick a Windows Live ID that you’ve already used to sign in on to OneDrive and use that to store and retrieve your podcast database for backing up or switching between devices. Visual Layer goodness: We’ve added aspects of the new Visual Layer both by default in the app as well as behind an experimental setting. If you turn that on you get more stuff. Along the way we’ve also made a ton of performance improvements for example in page navigation. Layout animations are shown in subscriptions and on the player page for transport controls. Adaptive UI: We’ve started to dip our toes into the water of adaptive UI. There’s a ton more to do to make the UX better take advantage but we’ve started this effort. Show notes display are back: We took this away in the last update and now show notes are back in a new pop-up window. Better telemetry: to help us identify and fix issues in deployment. ‘Nough said. Notable Bug fixes: reliability with downloading and playback but we’ve literally fixed err 88 bugs in this update. So that’s what we’ve been up to. Please feel free to download and play with the beta here. In the next post we’ll talk about the release plan for BringCast 4 and what comes next.